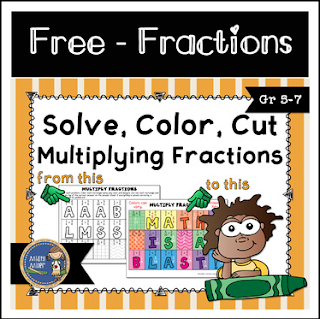 Practice multiplying fractions with this color activity. Students solve the multiplying fractions problems and color/design the rectangles as they want. Then they cut the pieces out and glue them to the answer sheet for an engaging & self-checking math activity. ➯ Be sure to follow my store to be alerted of new products. ➯ Don't forget to leave feedback. You will receive TPT credits that can be used on future purchases!